Daily mails are triggered by scheduler in one of our project for blogs. 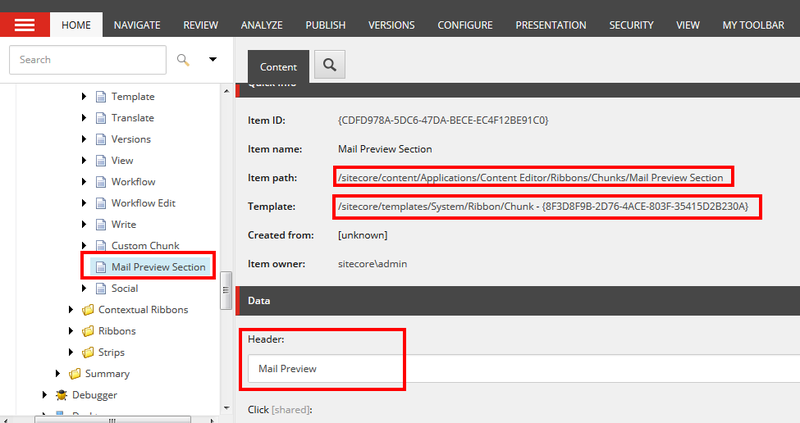 For the client prospective it is working great but they still want to preview a mail related with blog while working in Sitecore content editor area. 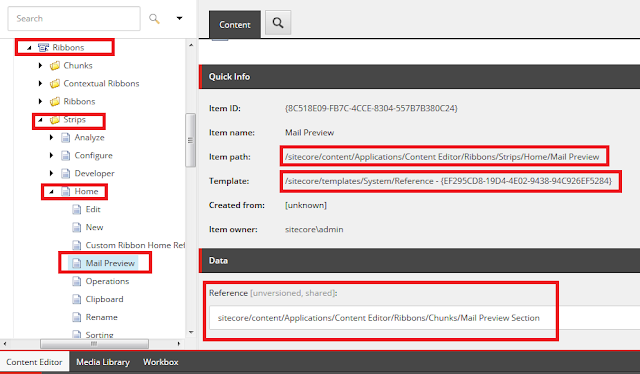 We plan to provide custom button in ribbon in Sitecore content editor and when user clicks on it, Sitecore open a model dialog box with HTML email content for the selected blog item in content editor area. 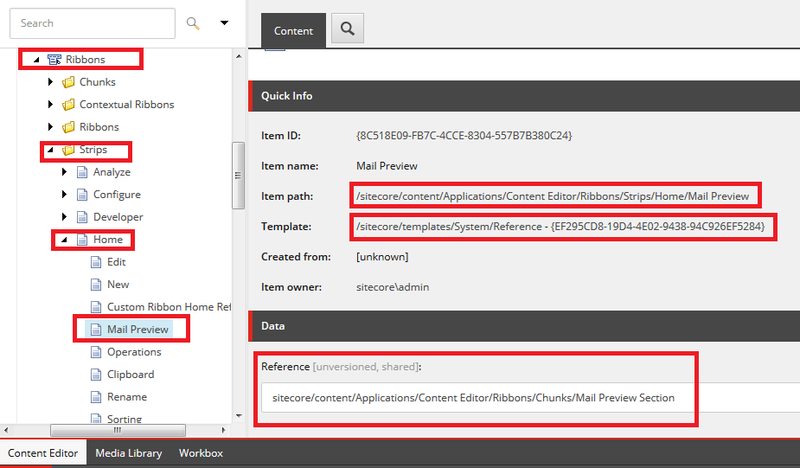 What is ribbon in Sitecore? When you logged into Sitecore content editor, a top region show a ribbon. There are different terms associated with ribbon like chunks, different controls, ribbon, reference etc. We will learn below lessons in this article to complete this requirement. How to add buttons in Sitecore ribbon? How to register event with Sitecore ribbon buttons? How to get selected item of content editor area? How to open particular page in model dialog box in Sitecore? Log in to Sitecore desktop mode. In my case I have added “Preview” large button item under “/sitecore/content/Applications/Content Editor/Ribbons/Chunks/Mail Preview Section” item which inherited from “/sitecore/templates/System/Ribbon/Large Button” template. We have created chuck section and its controls. Now we have to add this chuck into one of the ribbon stripe item. I am adding it into Home stripe. Till now we have completed all required things from Sitecore content editor point of view. Note :- Use MVC view rendering for better and clean HTML generation. After all these steps, you should get below output on click of “Preview” button. A below preview page should display for all valid blog item. Hurreyyy. 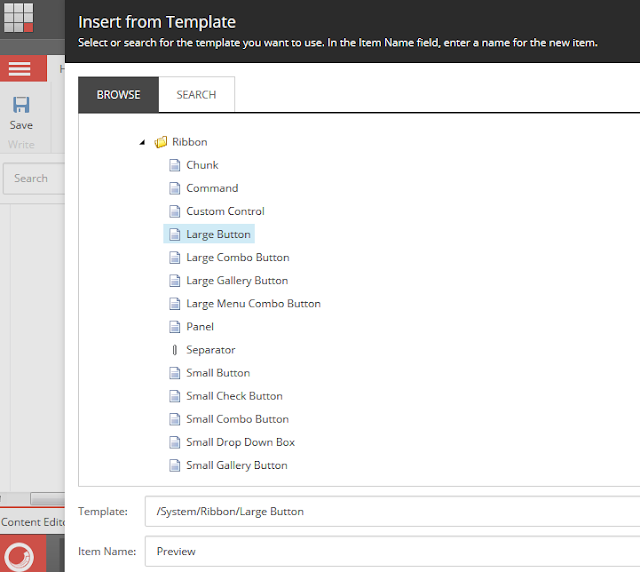 We learn another great customization feature of Sitecore. Please leave your comments or share this learning lesson if it’s useful for you.